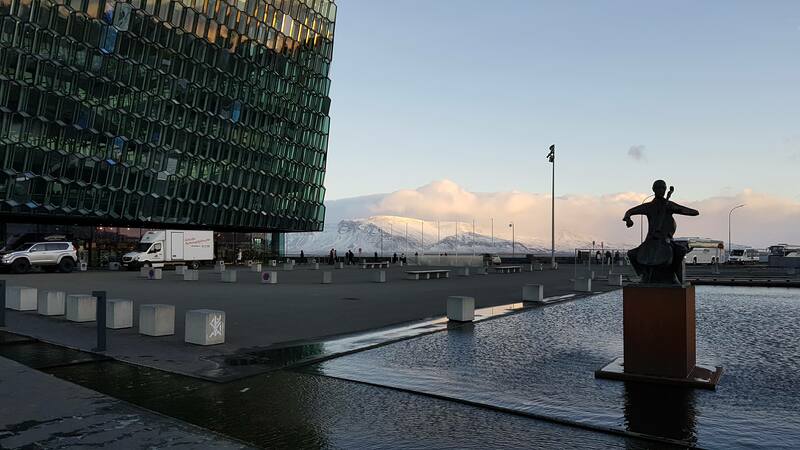 Iceland had been at the top of our list of places to visit for ages, so when easyJet announced their winter schedules, we booked return flights in November for £120. 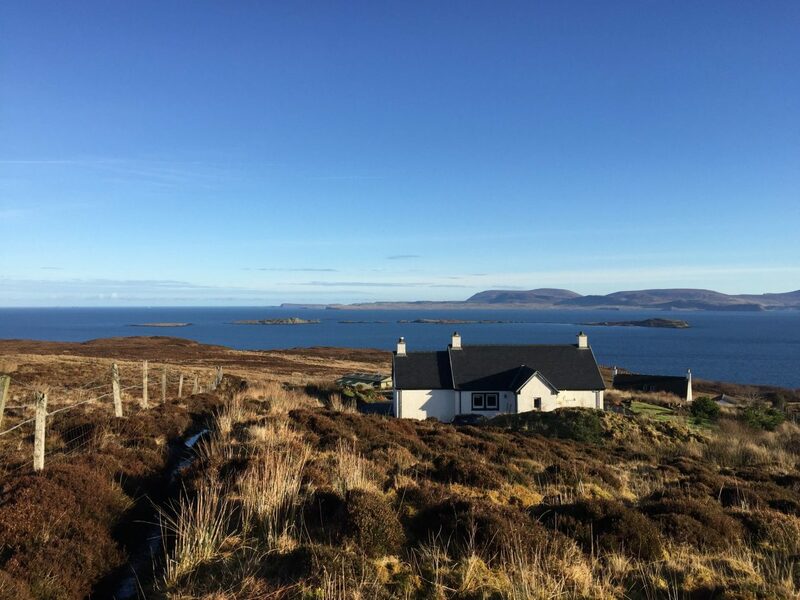 With a price like that and a flight time of under two hours from Edinburgh, it would be the perfect pre-Christmas adventure. 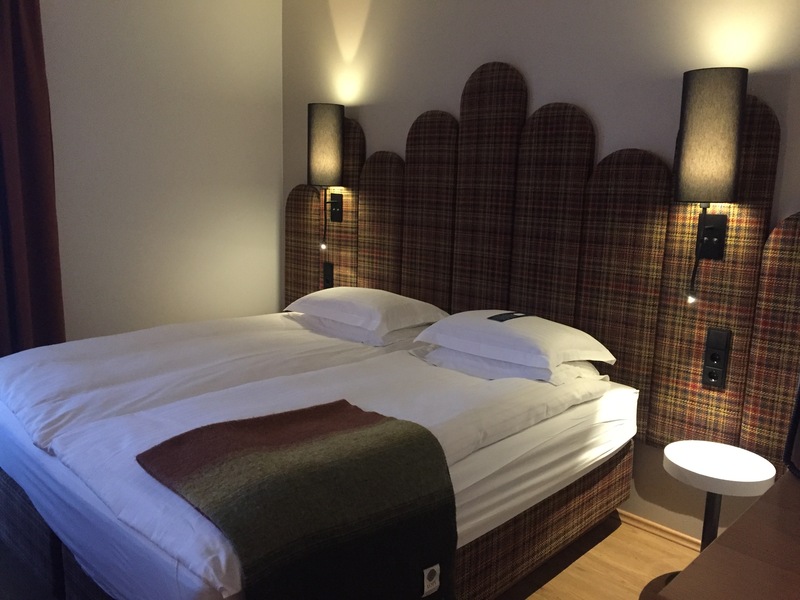 After lots of help with our planning from The Wee White Dug’s mummy and daddy who had fallen in love with the land of ice and fire, we decided to follow in their footsteps and book the Icelandair Marina Hotel. Perfectly located right on the harbour, Rick Stein stayed in the Marina hotel while filming his Weekend Break program so we felt like we knew it already. They have a few different room types available so make sure that you specifically ask for a harbour view room – they are the best! The Northern Lights are often visible from the room balcony, and even if they don’t put in an appearance, there’s always something going on outside. The temperature in Iceland isn’t as cold as you might think. When we visited, it was about minus 2 degrees centigrade both day and night with little variation. The big issue is the wind chill factor which drove the real feel temperatures down to about minus 10! 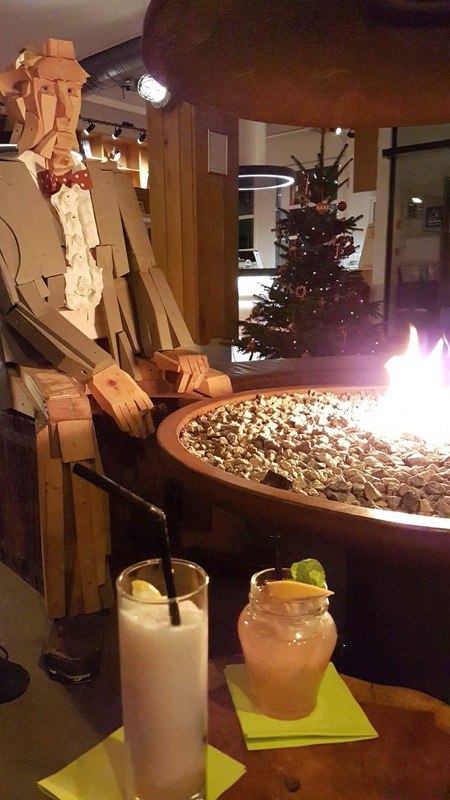 Hats, gloves, and scarves are essential to keep you cosy when you are outside, and The Icelandair Marina’s fire pit is always a welcome site when you return from a day exploring. We swithered about hiring a car for a few days to allow us to get out and about and explore the dramatic landscapes but the forecast during our visit looked quite wintry. We had read some horror stories of tricky driving conditions and hired cars being blow off the road in the Icelandic winds so decided to research group tours instead. 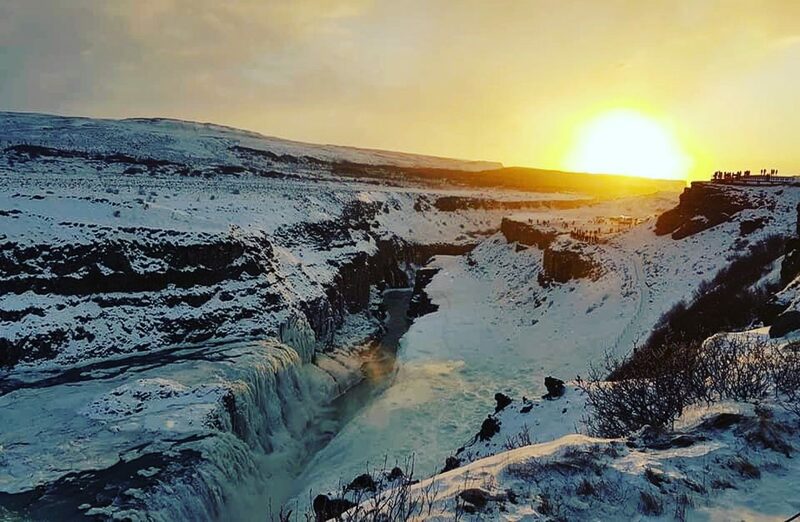 A tour company called A Perfect Day in Iceland came to our rescue and came up with great suggestions to see the best of Iceland in a short time. We had planned to spend three days in Reykjavik itself and then on the fourth day explore The Golden Circle by taking a gourmet group tour. Planning seemed to be our biggest mistake! Tanya our guide from Grayline Iceland told us that Icelandic people never plan anything. The weather in winter can be so unpredictable that it’s best just to go with the flow. 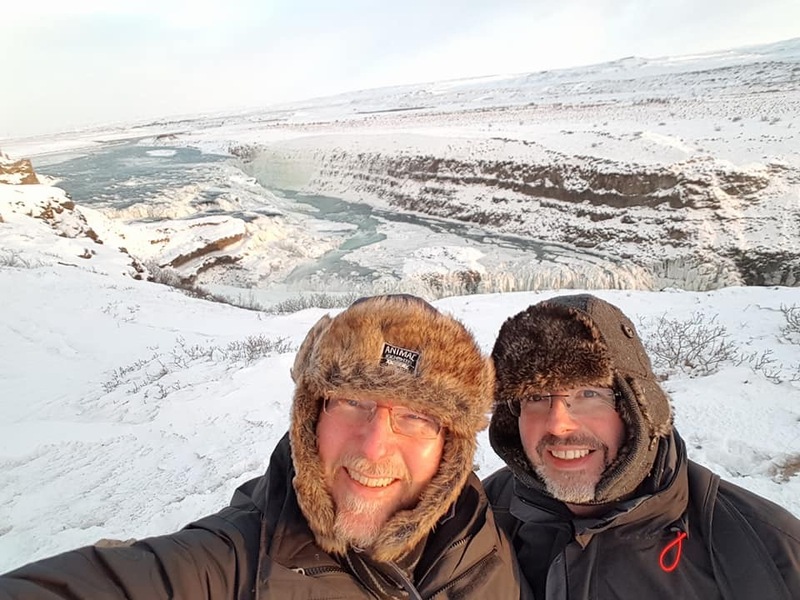 It turned out that two of our planned tours didn’t run due to the weather but thankfully A Perfect Day in Iceland was able to switch us to alternatives at the last minute. 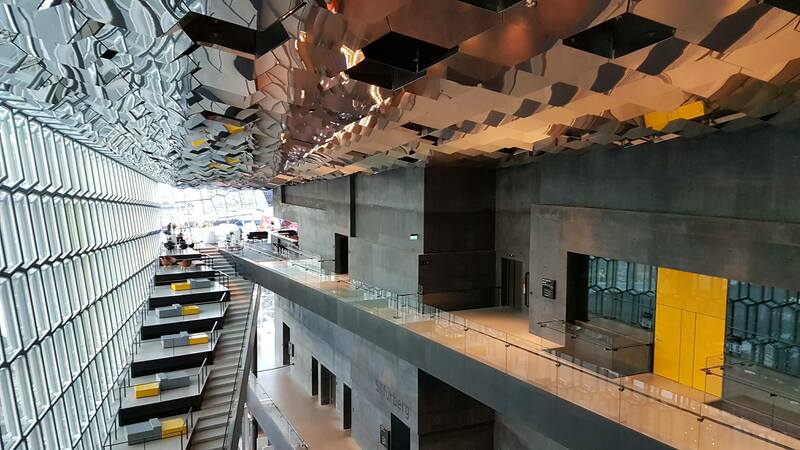 Harpa concert hall is stunning and a lovely place to wander around enjoying the warmth and views from the windows. Iceland’s basalt landscapes inspire the dramatic glass exterior. 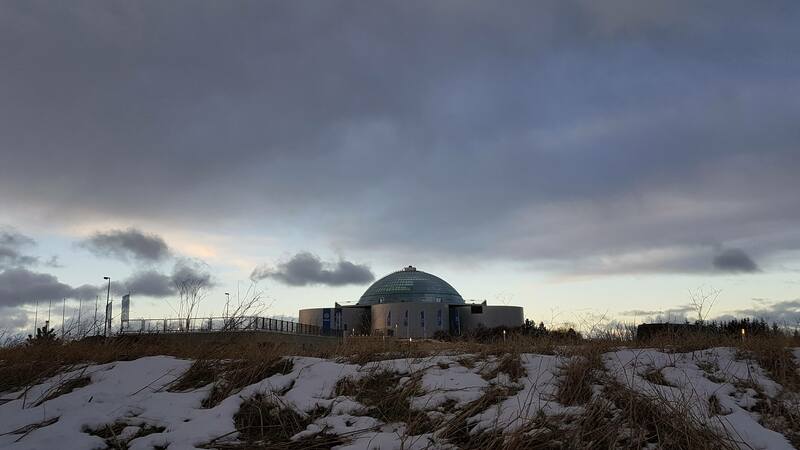 Perlan sits on one of the highest points in Reykjavik and was originally hot water storage tanks for the city. Now a museum and restaurant, the buildings were transformed in 1991 when a huge glass dome crowned the top of the building. A glacier and ice-cave exhibition on the ground floor feature a human-made ice cave over 100 meters long and made from around 350 tonnes of snow and ice. On the upper floors, they have a large gift shop specialising in Icelandic crafts so make sure you take your VISA card! 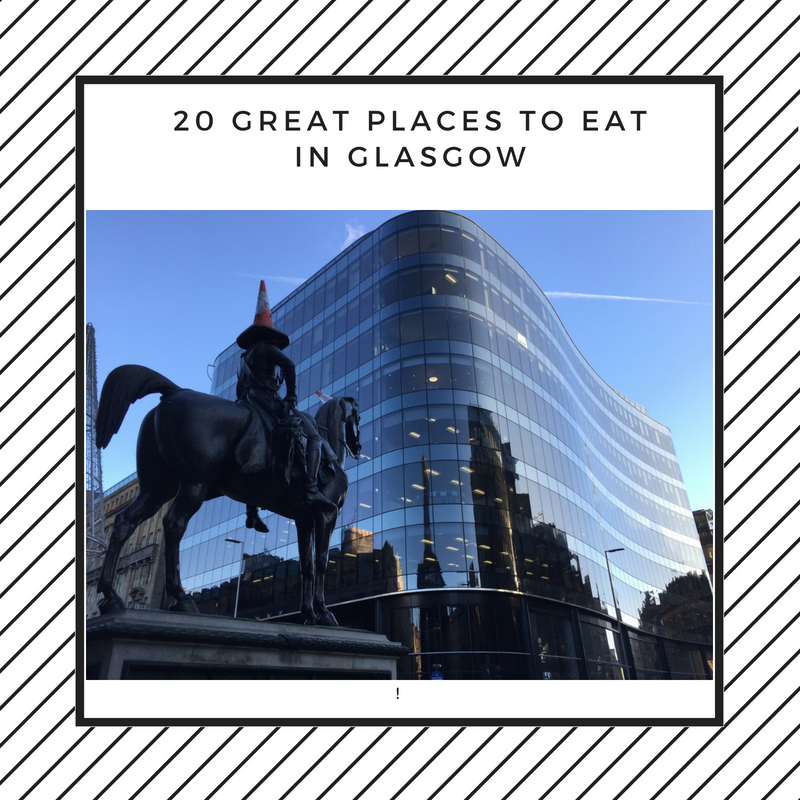 On the top floor, they have a revolving cafe and restaurant underneath the glass dome. We had coffee and a cake but didn’t dine at the restaurant. It looks like it would be a real treat and a perfect place to dine under the Northern Lights. 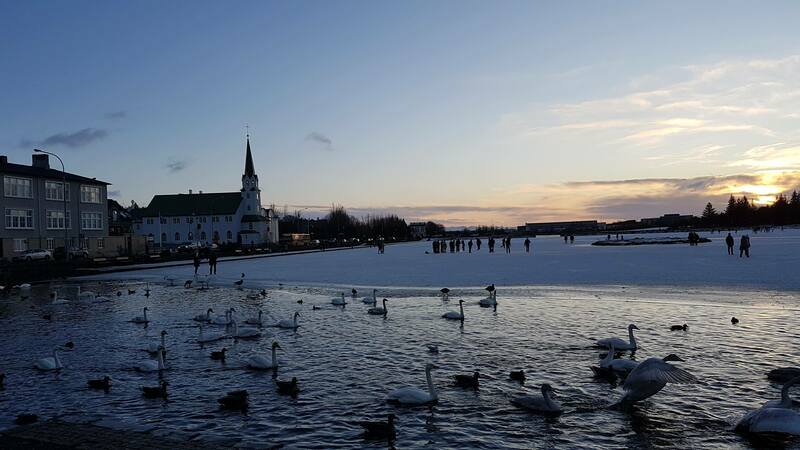 Tjörnin is a beautiful lake in the centre of the city next to the City Hall. We visited to check out the topographic map of Iceland in the City Hall, but sadly it had been removed for a few days, so we didn’t get to see it. Hot water is pumped onto a corner of the lake to make sure there’s water for the swans, geese, and ducks to enjoy. From here we also went to the National Museum of Iceland which is well worth a visit. 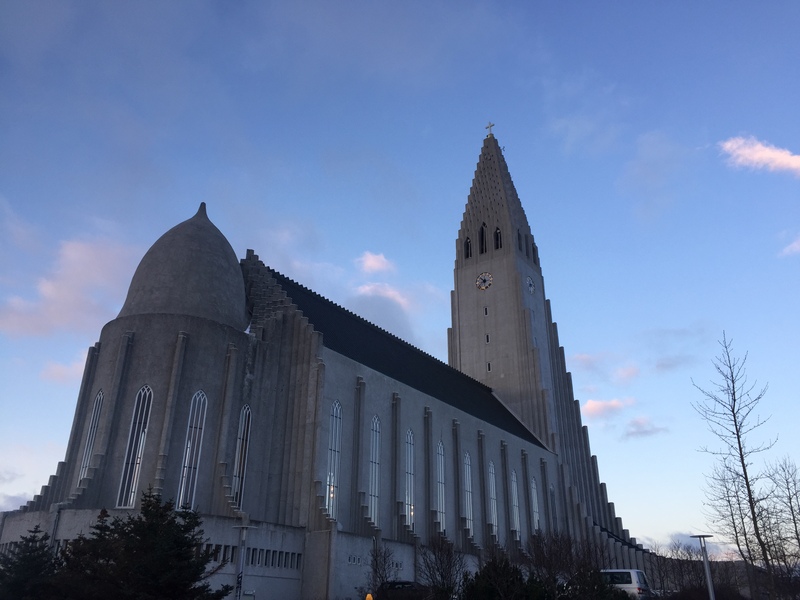 Hallgrimskirkja is probably the most distinctive landmark in Reykjavik and is a useful point of reference to help keep track of where you are in the city. We arrived about 10.40am, and the sun was just coming over the horizon behind the church. The view from inside is stunning as the suns rays pass through the windows behind the altar and hit the huge organ in the rear wall. You can also pay to climb the tower, and the views of the city are stunning. 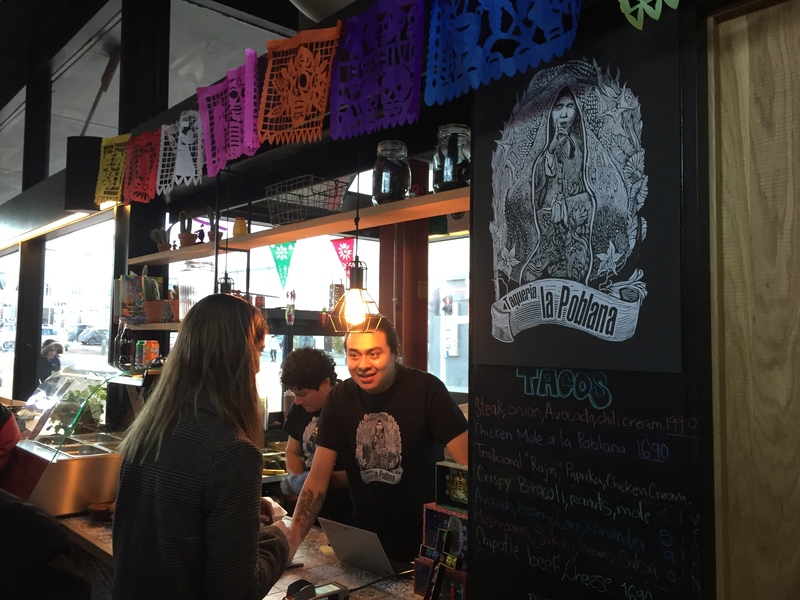 Hlemmur Mathöl is open from 8 am until 11 pm and is the place for street food and tasty bites in Reykjavik. 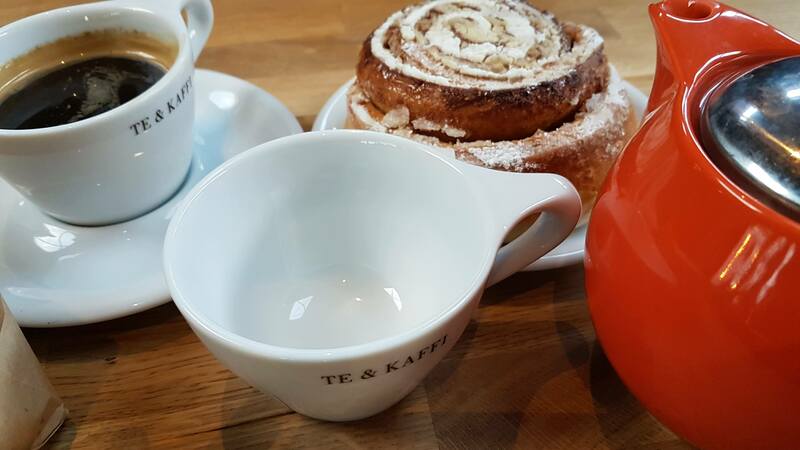 We highly recommend the cinnamon buns from Braud & Co – not cheap (but nothing is in Iceland) but amazing! A Perfect Day in Iceland suggested we try the Cheers to Iceland event that happens most evenings at Bryggjan Brugghús on Reykjavik harbour. 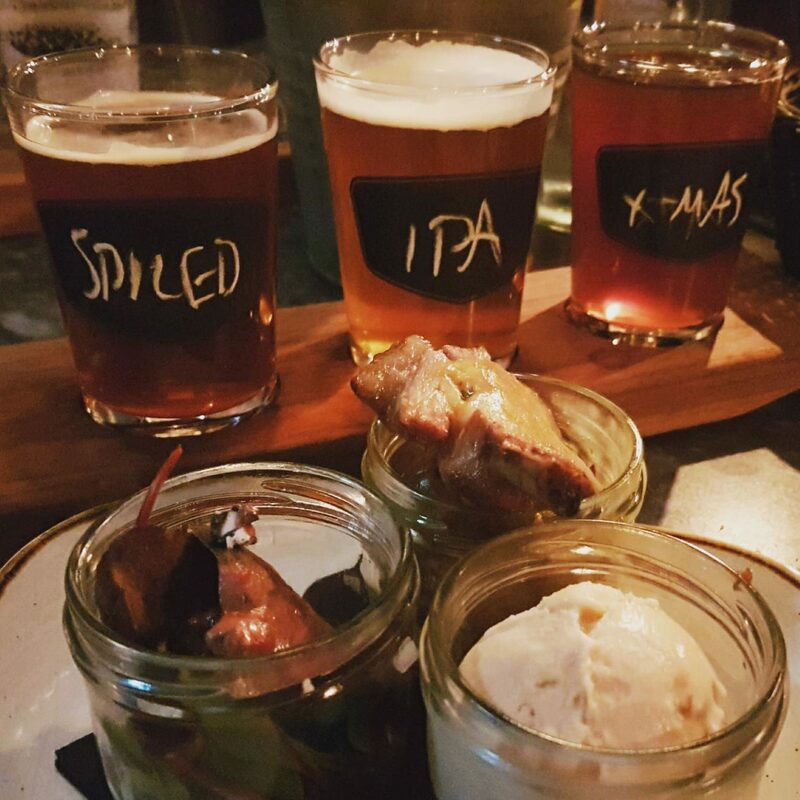 We had a thoroughly enjoyable evening tasting Icelandic craft beer and tasty tapas bites. 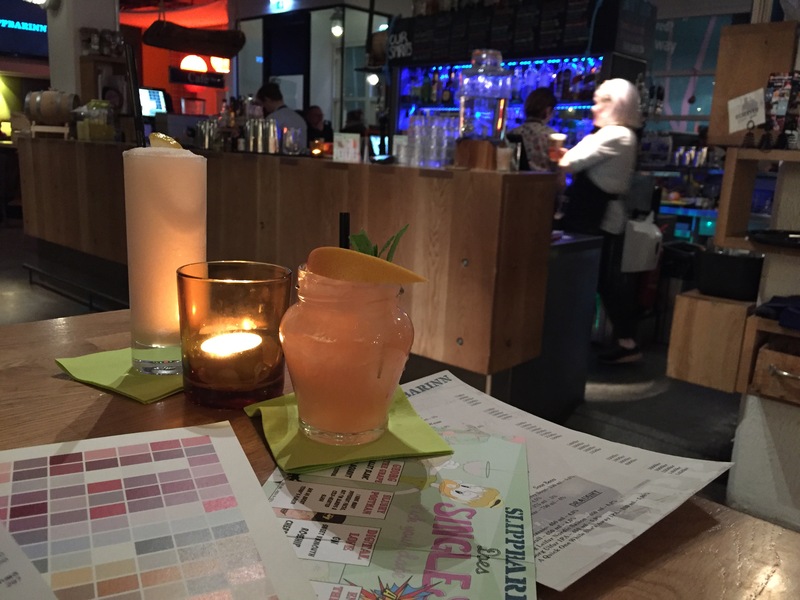 You can read all about our evening here. 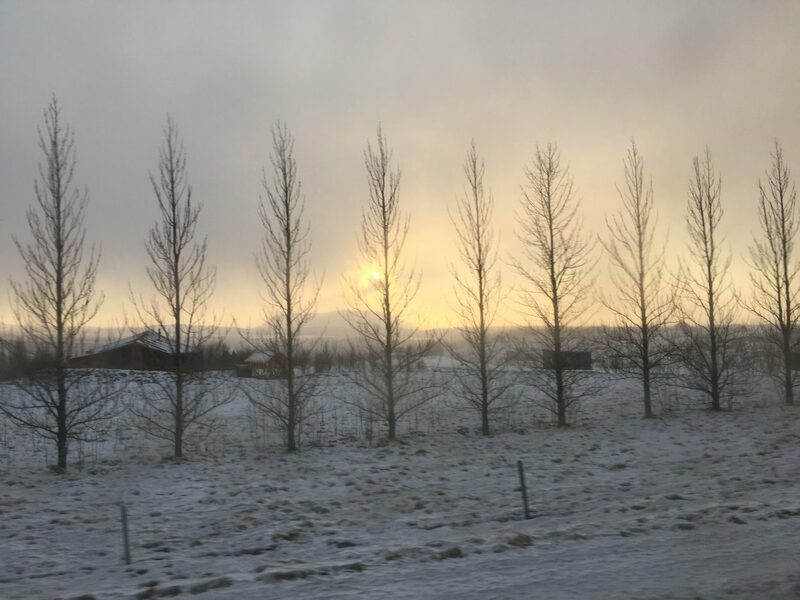 Due to the wild weather, we ended up taking an Express Golden Circle Tour with Grayline, and we were able to visit two of the three main highlights of our tour. When we heard that the trip was going to be an “express” trip we didn’t know what to expect but were very pleasantly surprised. We have always tended to avoid larger coach tours preferring smaller more intimate excursions but overcoming our coach tour concerns we ended up getting on the biggest bus Grayline had in their fleet as it was the most reliable in the snowy and windy conditions. 50 curious people clad in Gore-tex, hats, scarfs, and gloves all set off for the first stop, The Golden Waterfall. Tanya our tour guide was excellent – so warm, friendly and knowledgeable about the country and made out six-hour tour (not so express) such a memorable experience. 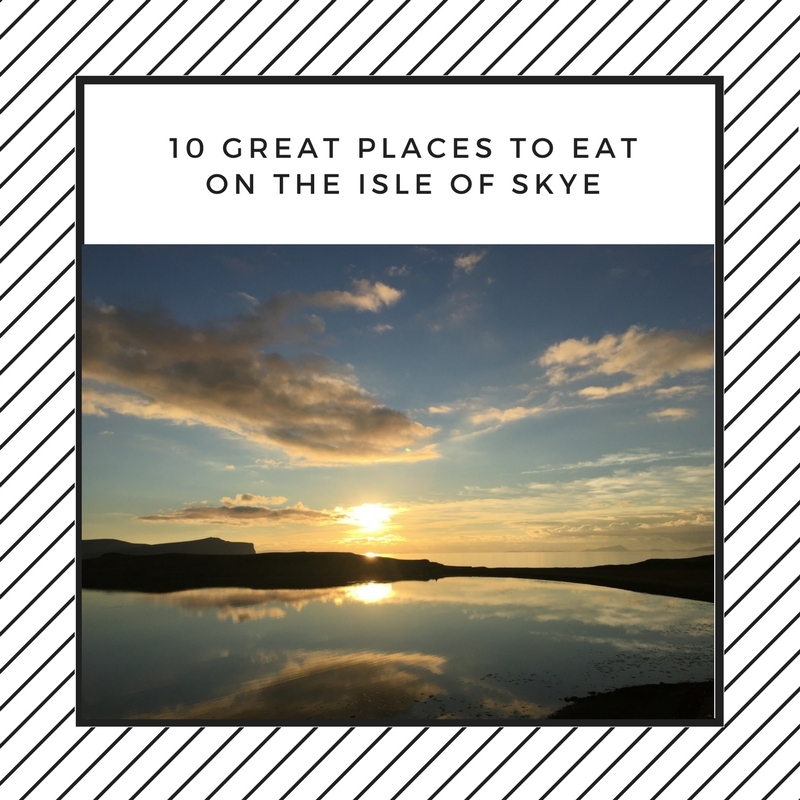 We were given plenty of time at each stop to explore the landscape with the option of walking along with Tanya or doing our own thing. The whole afternoon was relaxed, and we didn’t feel in any rush or under any time pressure during the tour. 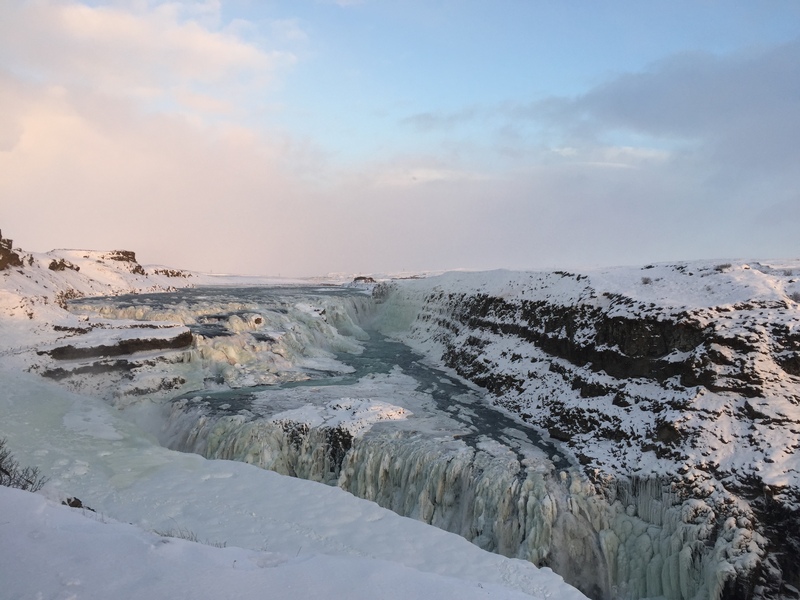 We had no idea what to expect when we visited Gullfoss Waterfall – we had seen the pictures, it looked amazing, and it would be lovely to experience it. Our visit, however, turned out to be one of these moments in life that you will never forget. As we approached the waterfall, the view was spectacular with the setting sun casting a warm glow over the ice. It was one of these exceptional moments in life that you are so honored to be experiencing and that you will never forget. 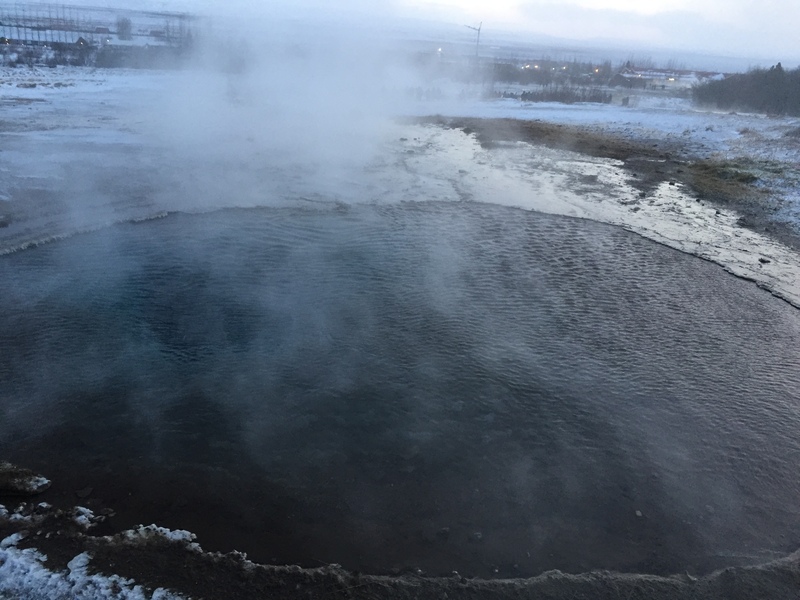 Our next stop was the Geysir geothermal area to see the erupting hot springs. 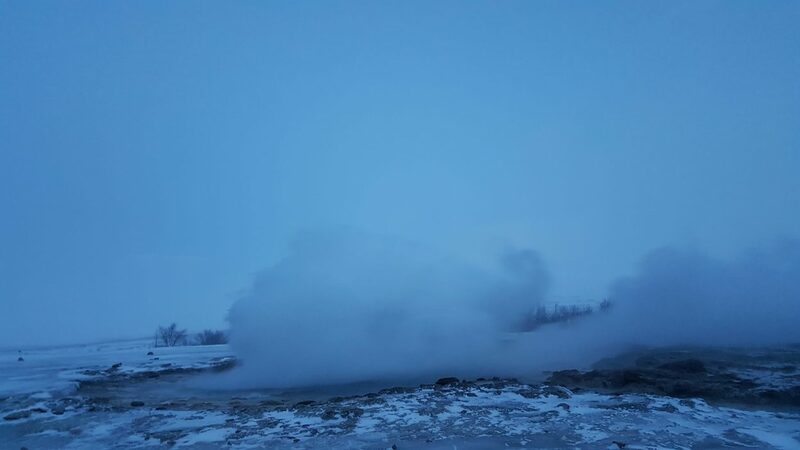 You don’t have to wait too long for a show as Strokkur shoots hot water and steam into the air every 10 minutes. The wind was so strong on our visit the spout was more horizontal than vertical, but still very dramatic. Standing on the icefields with snow falling and steam rising all around makes this feel like a very special place – you could easily be on another planet. We didn’t make it to the third stop, Þingvellir National Park, sadly the weather made the road impassable, and we couldn’t visit. A great excuse to go back though! After our visit to The Golden Circle, we headed back to Reykjavik, keeping our eye out for the Northern Lights on the way. Many of our fellow passengers were doing back to back tours with Grayline and heading straight of to search for the Northern Lights on their return to the capital. Grayline provides a fantastic service, collecting you from your hotel or designated bus stop and then taking you back on your return – a door to door service. What a wonderful day we had exploring Iceland and it’s an experience that will remain with us forever. 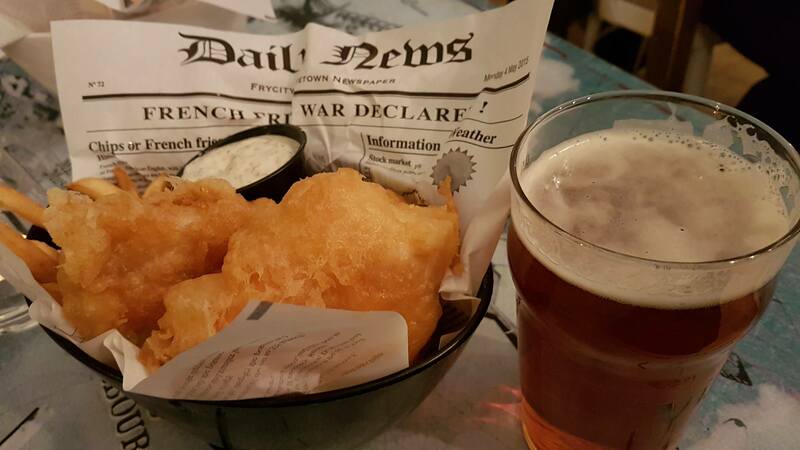 After a day exploring there’s only one thing for it when you get back to base – Icelandic cod and chips washed down with some local beer. 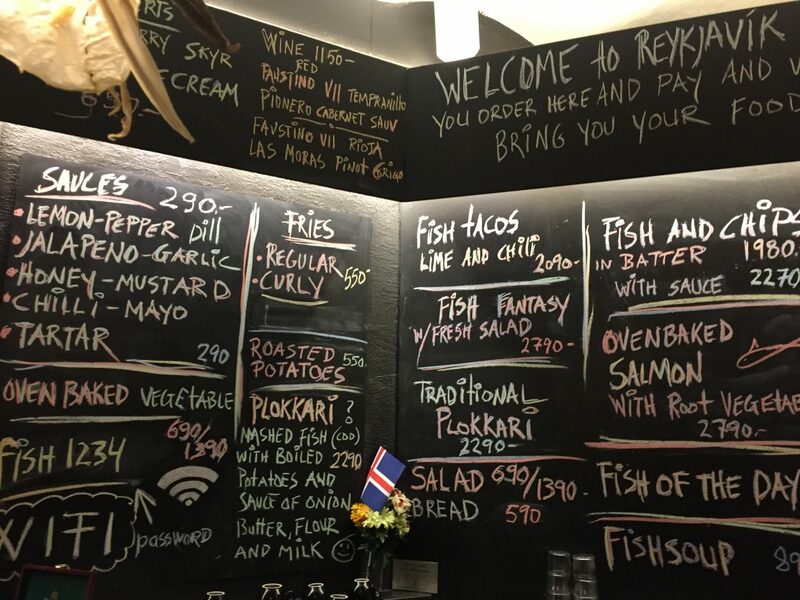 Iceland is famous for its fishing and cod is a specialty. 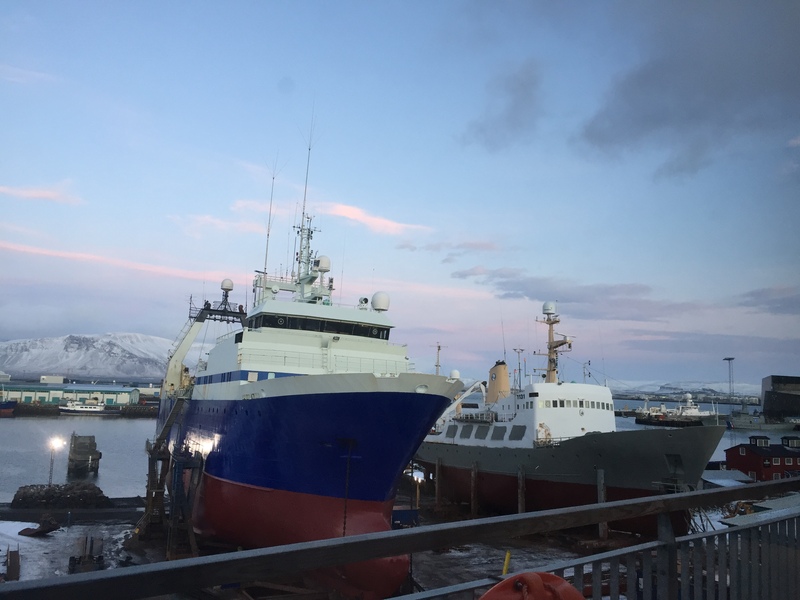 We went along to Reykavik Fish by the harbour for some Viking Beer and a Fish Supper – perfect batter and the freshest of fish. Delicious! We had a great few days in Iceland and can’t wait to return during the summer months to explore the island further. Iceland is one of the three most expensive countries in the world to visit, and it’s not a cheap holiday. Our flights were very reasonable so this helped to balance out the costs. 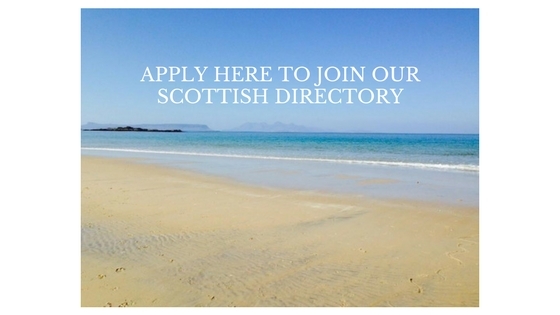 Scotland and Iceland have lots in common with both nations warm and friendly and proud of their land and heritage. 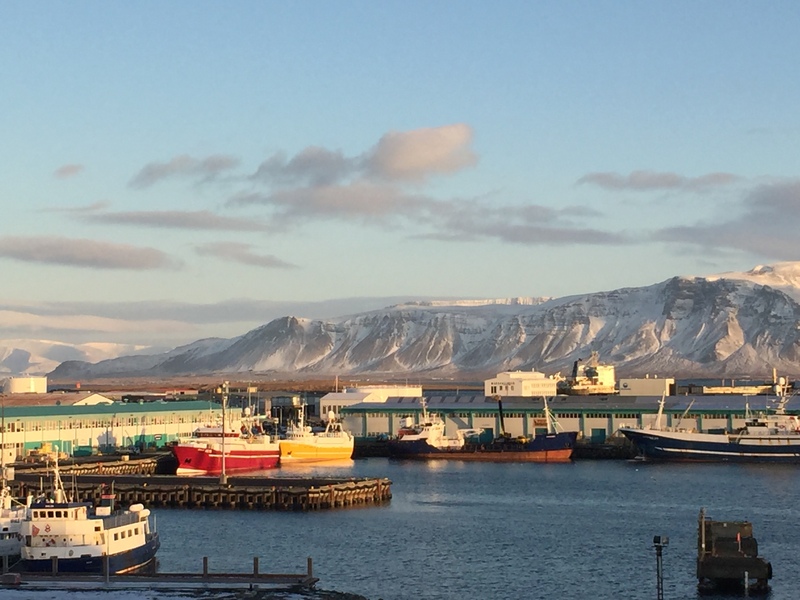 If you’re looking for a short break somewhere that’s magical then be sure to consider Iceland. Hopefully, if you time it right you will get to see the Northern Lights……sadly we didn’t! Just another reason we have to return. 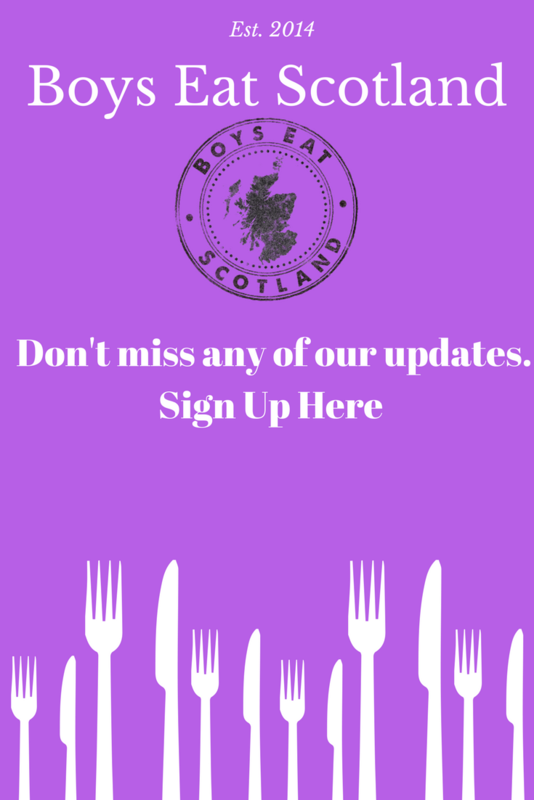 If you’ve been to Iceland and have any tips for other places to visit then leave a comment below and we can add them to our list for next time! 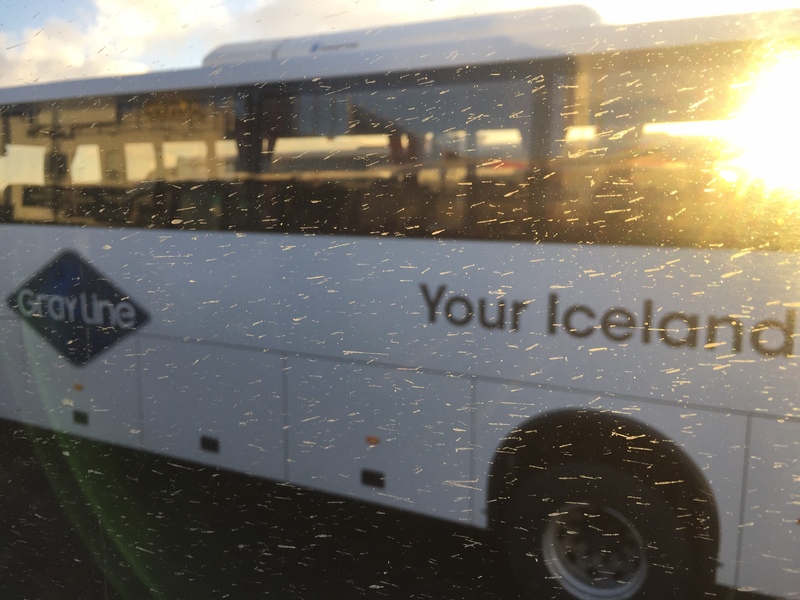 Thanks to Your Perfect Day in Iceland, Reykjavik Sightseeing and Grayline Iceland for organising our fantastic Icelandic experiences.